The Avid Juicy Ultimate brake fits rotors from 140mm to 185mm, front and rear and is designed for ultimate weight saving, losing 50g off the standard weight. Intended Use is for Light weight Cross Country. Finish: Stealth Black. 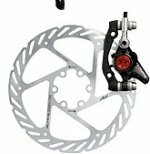 Rotor Sizes: 160mm,185mm front only, 140mm rear only. Rotor Design: New G2 Clean Sweep. Mounts:Front - Fits both I.S. and Post mount. Rear - Fits I.S. only. Weight: 345g.